The committee currently tasked with overseeing Arizona’s Department of Child Safety held its last quarterly hearing last week. The bottom line from that hearing was that, although the agency has made some improvements over the last two years, it remains very much in crisis. But despite the significant problems his agency continues to face, Director McKay’s testimony was once again more evasive than transparent. Many of the problems DCS has faced since its creation, and which were supposed to be resolved by agency’s high caseworker turnover rate. And it takes DCS more than twelve months to find permanent homes for more than two-thirds of children in its system. Every one of those factors is bad for Arizona’s most vulnerable children. The lack of transparency at DCS has been a problem in the past, and members of the oversight committee repeatedly made it clear during last week’s hearing that DCS was not providing enough useful information about the agency’s progress. McKay has resisted recommendations for reform and actually reduced his agency’s transparency. And there is no evidence that Gov. Ducey will start holding McKay accountable. It is critical that a new Legislative oversight committee is established. Arizonans and their Legislators cannot become complacent with the marginal progress and limited cooperation that DCS has displayed under Director McKay. Protecting our most vulnerable children is simply far too important. 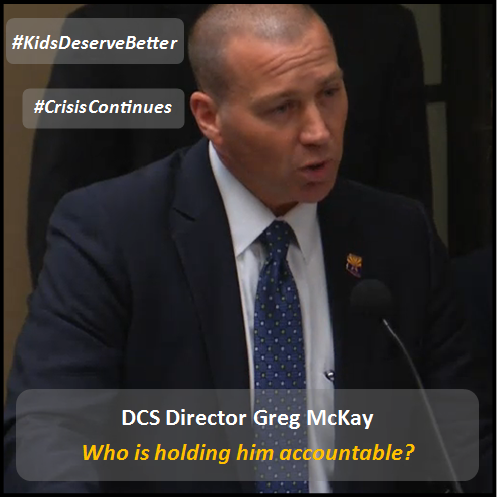 McKay needs to truly be held accountable, and the children in our DCS system need robust legislative oversight to make that happen.